Recently I was in the kitchen with our daughter whipping up a brand new concoction that we’d never heard of before – just making up the recipe on the fly, but our dish needed breadcrumbs. Thankfully they’re super easy to make and today I already had a jump start on them. So I had chopped it up & sat it aside to begin drying. But now I’ll use that bread to whip up some homemade breadcrumbs in a flash. I pulled out the extra bread leftover from the night before. It was already sliced thinly and partially dry. It wasn’t a large quantity so I just placed the pieces on my cast iron comal and placed it in the oven. 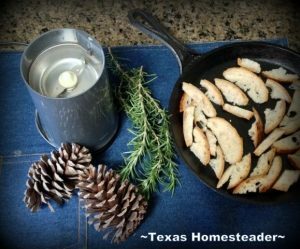 You can use a cookie sheet or even a casserole dish – anything that will allow you to spread your pieces of bread out on the surface without touching each other. I turned the oven on for about 1 minute to allow it heat up and then I turned it off again. That would be enough heat to thoroughly dry these pieces of bread. Making sure your bread is completely dry helps keep it from molding in storage. With a few quick pulses – bibbidy bobbidy boo! The dried bread was magically transformed to my very own homemade bread crumbs for just the cost of a little unused bread! I especially love that I’ve once again easily reduced food waste in my kitchen simply by turning food that wasn’t used into a food item that is often typically purchased. Score one for the grocery budget and also one for being environmentally friendly. BOOM! Now if you like, you can flavor your breadcrumbs by tossing in dried herbs along with your dried bread cubes. Maybe some rosemary or thyme, whatever flavor you like! 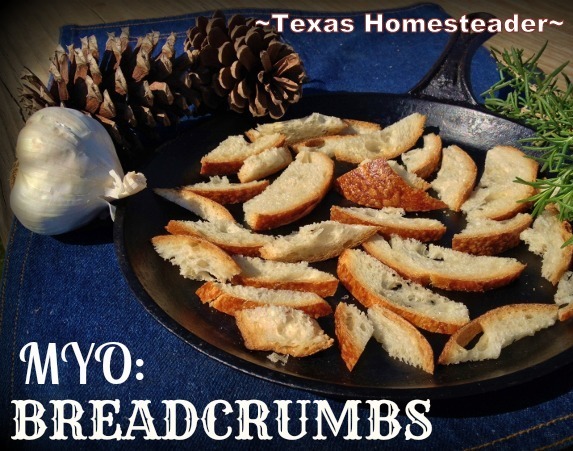 I typically leave my breadcrumbs unflavored so I can use them in a wide variety of dishes. It’s a required ingredient in RancherMan’s favorite Potato Cakes or fish croquettes and also often sprinkled on the top of various casseroles. So I typically have unflavored breadcrumbs stored in a glass canning jar in the pantry just waiting to be used. Is Food Past The Expiration Date Safe To Eat? I think this is such a good idea but I never do it, I guess it’s always about timing. Thanks for the quick tip to put small batches in the oven. I think even I can manage that! Thanks for stopping by Front Porch Friday, I’m featuring your post this week. I used to save my extra bread, but now my teen boy gobbles it all and we never have any “extra.” Thanks for posting. Hello from Mostly Homemade Mondays. home-made bread crumbs are so much better than the shop bought ones! Good on you for DIYing! ps – popping over from the what’s on the list link up party. 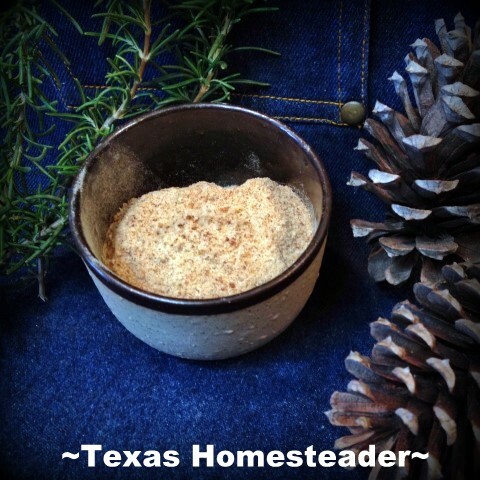 One nice thing about making own bread crumbs…very easy to do. I use French bread a lot of times when I make mine but pulse mine in the blender…no coffee grinder here but I bet a grinder would work good for something like that. Had a little shaking going on here around 6pm yesterday. We had a 4.0 earthquake of which knocked things off the wall and shelves. This was the 2nd strongest one we have had here in Johnson County. The other one we had was a 3. 5 I think. (was a 3. something) The one last night tho was a real shaker.